I didn't realise it, but on the 1st of February 1979, the Shah of Iran was overthrown by angry crowds throughout Iran. It was unprecedented in the age of modernity that a popular revolution would put in place an Islamic Republic rather than any party motivated by the ideologies of the European enlightenment. Saddam Hussein, then the darling of the United States, was encouraged to fight a devastating war against Iran, thinking it was in a weakened state and eventually reducing his country from a modern and developed nation to a debt-ridden and weak country which would eventually invade Kuwait and threaten his former backers in the Gulf. Of course we know what the United States then did to Iraq and Saddam and the result is as we see it today. 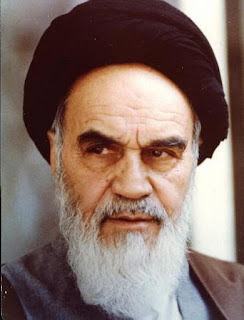 I've supported Iran as an Islamic state, as well as in its position against the United States and Israel, but I haven't the stomach for the harsh and sometimes brutal austerity Khomeini brought with him. Still, he was no fool and chain of events he set in motion since then are being felt right up to the present. The United States (as well as Israel) still don't know what to do with Iran, which is a good thing. Also, I discovered a new word today that I quite like: Gharbzadegi. I have come to realise many Arabs have that same disease. "I say that gharbzadegi is like cholera [or] frostbite. But no. It's at least as bad as sawflies in the wheat fields. Have you ever seen how they infest wheat? From within. There's a healthy skin in places, but it's only a skin, just like the shell of a cicada on a tree." And shortly thereafter, leftists around the country--who also participated in the revolution--were rounded up and executed. Thanks for the link mate! Yes they were. It's a messy business, this revolution stuff. messy - cute.. not a massacre? not a crime against humanity? not a brutal act of a monster? no - for maysaloon its just messy..
iran is wallowing in its own demise as we speak.. price of oil down from over 140 a barrel to around the 40.. youd be bleeding too if all you were left with was a very expensive production line for a very devalued commodity with very high local consumption while ur school ground enemy to your south west can produce it at a fraction and doesnt even really need it half as much as you do..
now that the world's biggest guzzler has announced a purposive shift of focus to green energy and since china has to because its people cant breath - i think it wont take too long before iran is exposed for the disaster that it is as a country so ill run that it is virtually bankrupt..
sparking wars between israel and palestine didnt even pump up its price..
its good that you "support" (heaven knows by what means) a regime that relies on the slaughter of your palestinian brothers to fuel its oil based economy..
shame on you.. arab hater..
How many people were executed in the French Revolution? Yet most people argue that the French Revolution is one of the great events of history. I don't support the type of regime in Iran, but let's put things in perspective. YAMAN: "...And shortly thereafter, leftists around the country--who also participated in the revolution--were rounded up and executed..."
all the leftist parties began to undermine the government and the leadership of imam khomeini, and plotting to assassinate and overthrow... therefore, yes, they were taken care of. they did not go along with the people, but had their own agendas.